Background: The use of antimicrobial agents affecting several biological targets at a time is one of the promising ways to fight multidrug-resistant bacterial strains, and hence it may serve to increase the efficiency of chemotherapy. Among the potential antimicrobial agents acting in this manner are redox-active complexes of transition metals with sterically hindered diphenols. Method: We synthesized the redox-active complexes of cycloaminomethyl derivatives of sterically hindered diphenols with Zn(II) ions and estimated the level of their antimicrobial activity against Gramnegative bacteria (Escherichia coli, Pseudomonas aeruginosa, Serratia marcescens, Salmonella typhimurium), Gram-positive bacteria (Bacillus subtilis, Sarcina lutea, Staphylococcus spp., Mycobacterium smegmatis), moulds (Aspergillus niger, Fusarium spp., Mucor spp., Penicillium lividum, Alternaria alternata) and yeasts (Candida spp.) as compared to some standard antimicrobials. The compounds were characterized by means of physico-chemical and pharmacological screening methods. Results: The coordination core of these complexes is a tetrahedral chromophore [ZnO2N2], the phenolic ligands being coordinated in monoanionic form (phenolate). The MIC value (0.010-0.027 µmol·ml–1) comparable to those of standard antibiotics (tetracycline, streptomycin, chloramphenicol) was achieved by structural modification of the ligands and complexation with zinc ions. The derivatives of orthodiphenols and their Zn(II) complexes were found to be able to reduce cytochrome c - one of the key components of the respiratory chain of microorganisms (υ=0.3-1.8 nmol.min–1). 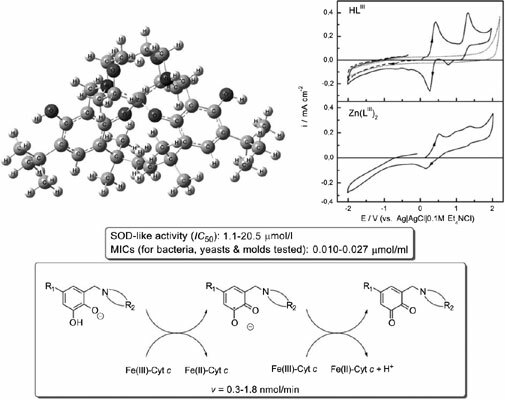 The investigation of SOD-like activity provided a means to reveal potential SOD mimics (IC50=1.1-20.5 µmol.l–1) among the ortho-diphenols and their Zn(II) complexes synthesized, because IC50 for the native Cu, Zn-SOD is 0.1 µmol·l-1. Conclusion: The correlation between the antimicrobial activity of these compounds and their reducing ability deserves particular attention since they possess both antioxidant and antimicrobial activities. Keywords: Antibacterial activity, antifungal activity, diphenol, Zn(II) complexes, voltammetry, cytochrome c, SOD-like activity. Keywords:Antibacterial activity, antifungal activity, diphenol, Zn(II) complexes, voltammetry, cytochrome c, SOD-like activity. Abstract:Background: The use of antimicrobial agents affecting several biological targets at a time is one of the promising ways to fight multidrug-resistant bacterial strains, and hence it may serve to increase the efficiency of chemotherapy. Among the potential antimicrobial agents acting in this manner are redox-active complexes of transition metals with sterically hindered diphenols.